Yet again, a powerful hurricane has devastated a Caribbean island. Earlier in September, it was Barbuda, Saint Barthélemy, and the Virgin Islands that took a direct hit from Irma. 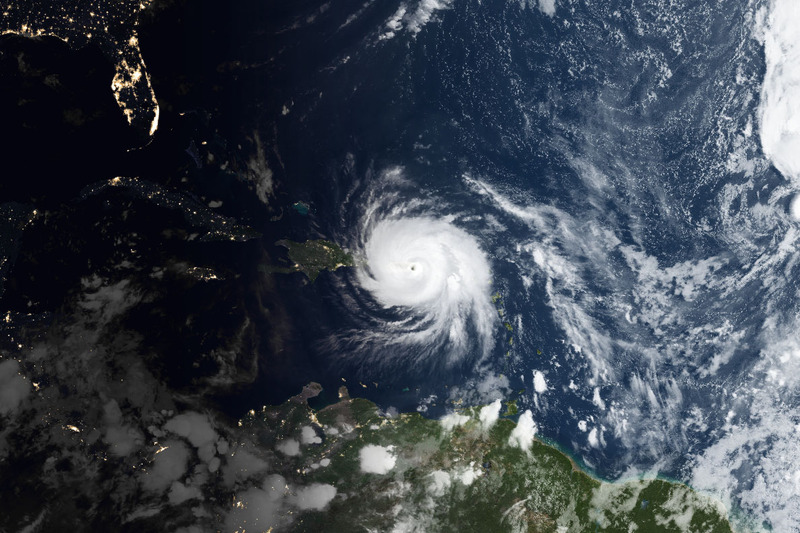 On September 19, category 5 Hurricane Maria battered Dominica. Now Puerto Rico has taken its turn. 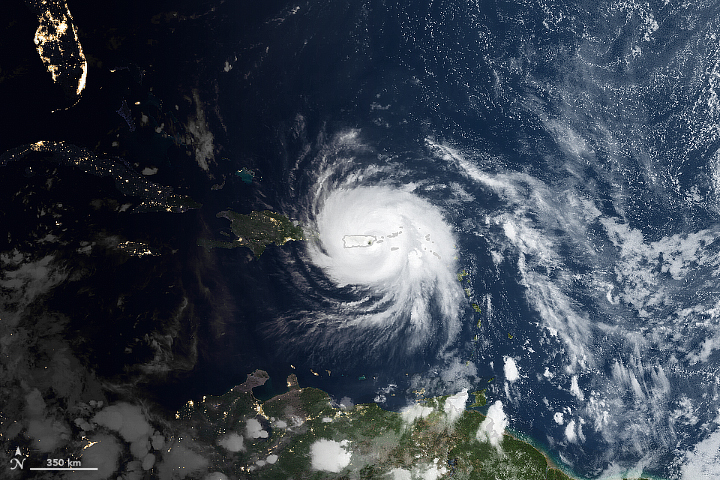 While Maria weakened slightly before making landfall on September 20 in southeastern Puerto Rico, the storm’s track was a near worst-case scenario. It ripped directly across the island with sustained winds of 155 miles per hour (250 kilometers per hour). That made it the fifth strongest hurricane to ever hit the United States. 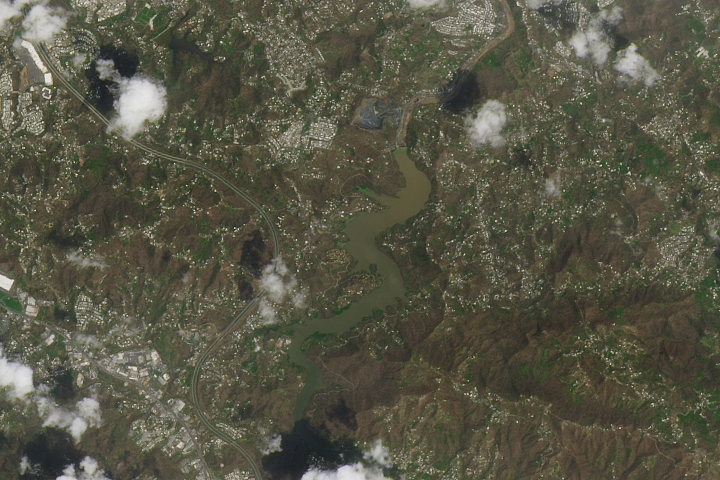 The composite image above shows Maria as it was making landfall near Yabucoa. Infrared (band 4) and visible data (band 1) from Geostationary Operational Environmental Satellite 13 (GOES-13) acquired at 6:15 a.m. local time (10:15 Universal Time) is overlaid on blue marble data from the Moderate Resolution Imaging Spectroradiometer (MODIS) and black marble data from the Visible Infrared Imaging Radiometer Suite (VIIRS). 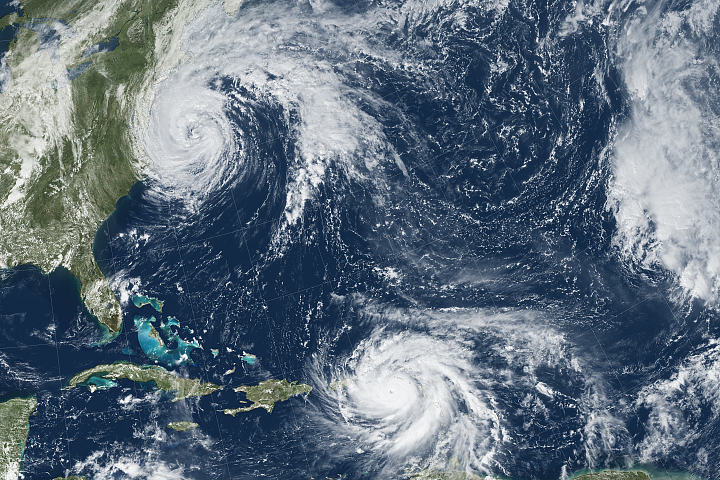 The series of GOES satellites are operated by the National Oceanic and Atmospheric Administration (NOAA), while NASA helps develop and launch them. The second image is a thermal image captured by the MODIS on NASA’s Terra satellite. Colder clouds, which are generally higher in the atmosphere, are shown with white. Somewhat warmer, lower clouds appear purple. 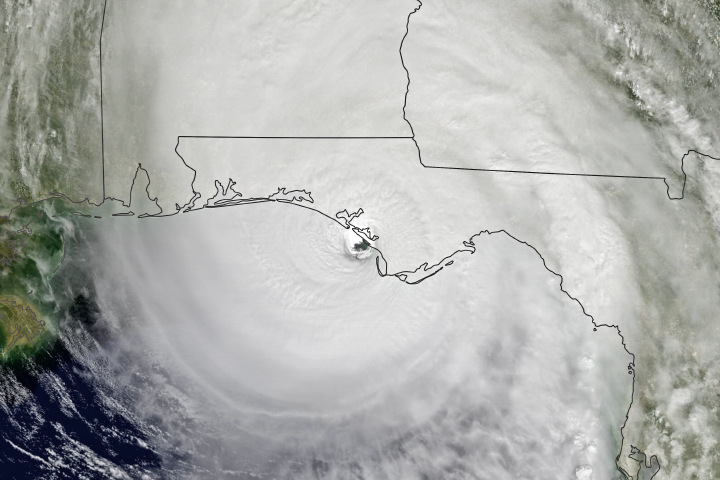 The image reveals a very well-defined eye surrounded by high clouds on all sides—an indication that the storm was very intense. Preliminary reports suggest that the damage in Puerto Rico is widespread and severe. Electricity was out throughout the entire island. Powerful winds tore off roofs. Cell phone service is offline in many areas. Storm surges flooded many coastal towns and cities. 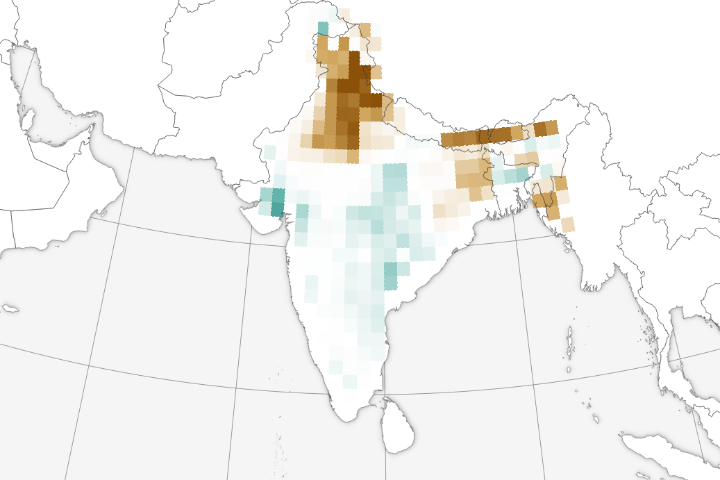 Extreme rainfall rates—some areas reported 5 to 7 inches (13 to 18 centimeters) falling per hour—fueled destructive flash floods and landslides. 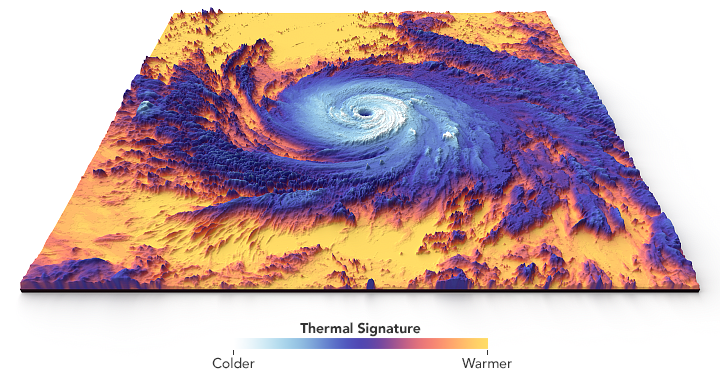 “The passage of the eye wall over 3,000-foot terrain must have resulted in incredible rainfall amounts—similar to Harvey but occurring in just a day,” said Stephen Munchak, a research meteorologist at NASA’s Goddard Space Flight Center. 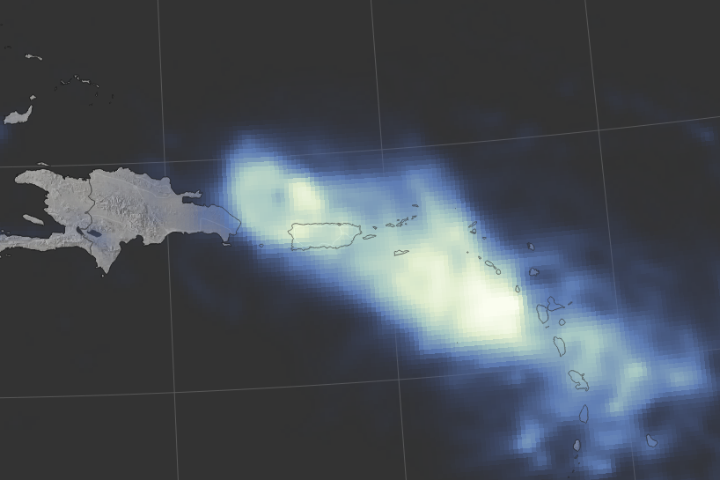 NASA scientists will be monitoring the storm and gathering data from satellites and planes to assess the damage wrought by Maria. 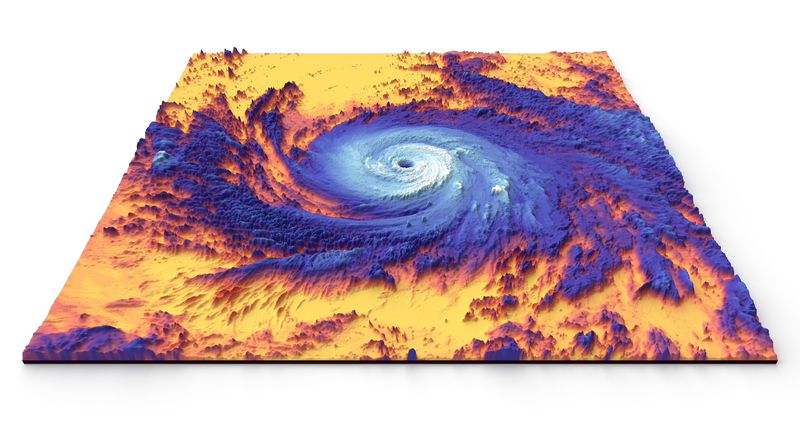 “Scientists are working with academic partners to leverage NASA, NOAA, and international satellite data helpful for identifying damage that results from Maria, including mapping of flood waters from synthetic aperture radar using Copernicus Sentinel data processed by the European Space Agency, flood water detections from Landsat 8, Aqua/Terra MODIS, and Suomi-NPP VIIRS,” said Andrew Molthan, also a member of NASA’s disasters group. NASA Earth Observatory images by Joshua Stevens, using data from the NASA-NOAA GOES project and LANCE/EOSDIS Rapid Response. Story by Adam Voiland. Scientists are assessing the damage after the category 4 storm hammered the island with powerful winds, storm surge, and extreme rainfall. Category 6 Blog, Weather Underground (2017, September 20) Maria Slams St. Croix, Rips Across Puerto Rico. Accessed September 20, 2017. NASA Earth Sciences Disasters Program (2017) Hurricane Maria 2017. Accessed September 20, 2017. National Hurricane Center (2017) Hurricane Maria. Accessed September 20, 2017. The New York Times (2017, September 20) Hurricane Maria Live Updates: Puerto Rico Loses Power, Officials Say. Accessed September 20, 2017.